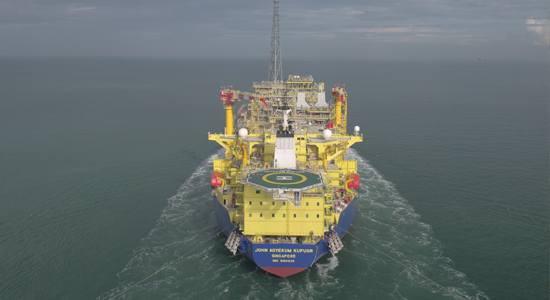 The Floating Production Storage and Offloading Unit (FPSO) John Agyekum Kufuor arrived in Ghana recently from Singapore and produced its first oil at the Offshore Cape Three Points Block Offshore a full three months ahead of customer ENI’s schedule. In 2014 OMA Ghana Limited formed a joint venture with Yinson Production Pte Ltd of Singapore and together won the bid to build and operate the OCTP Floating Production Storage and Offloading unit (FPSO) for Italian energy company ENI. In 2015 the OMA Ghana-Yinson JV was awarded the lease, operations and maintenance contract for 15 years, with a 5 year additional option. The FPSO is expected to arrive in Ghana during the first half of 2017, with operations due to commence a few months later, in August. OMA Ghana will provide significant support services throughout the installation and operational phase of the project.